Whether you're just beginning with your LEGO MINDSTORMS NXT set or are already an expert, you'll have hours of fun with these animal-like models that walk, crawl, hop, and roll! The first part of the book introduces you to the NXT kit and reviews the parts you'll need in order to begin building. Next, you'll learn how to program with the NXT-G programming language, including how to make miniprograms called My Blocks that you can use to build larger programs. Finally, you'll learn how to build each robot and program it to act like its real animal cousins. Polecat, a skunk on wheels that lifts its tail and shoots "darts"
Troubleshooting tips help you avoid problems like misarranged gears and incorrect programming, while a list of Internet resources is included to help guide you in further exploration with the NXT. Teachers and home educators will appreciate an appendix with helpful suggestions for using the models in the classroom. The models in this book have been tested repeatedly - and built successfully - by novice builders, so all you have to do is follow the directions and watch them go. Now, let the building begin! 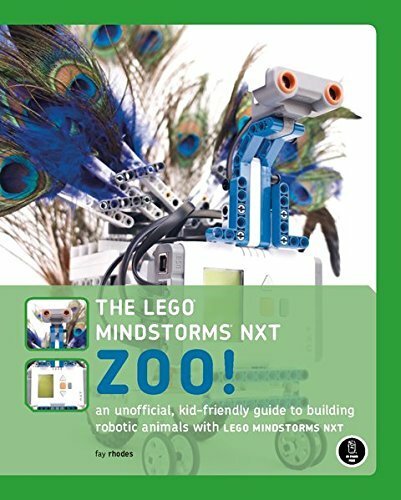 LEGO MINDSTORMS NXT Zoo! offers step-by-step instructions for building nine animal robots with the NXT Robotics System. Using the book's detailed building and programming instructions, kids (and their parents) are introduced to the MINDSTORMS NXT kit as they build animal-like models of a rabbit, spider, peacock, stegosaurus, and more! But these models don't just sit there-they walk, crawl, hop, and roll. The book will also show you how to make the models sound like the real animals that inspired them. Troubleshooting tips help builders avoid common pitfalls and parts lists make sure they have everything they need before building. An appendix includes ideas for teachers using these models in the classroom. Fay Rhodes is co-author of The LEGO MINDSTORMS NXT Idea Book(No Starch), a 2007 member of LEGO's MINDSTORMS Community Partners (MCP), and the only female contributor to the NXT Step Blog.